This is yet another example of what seemed at the time a great and revolutionary accessory, but simply did not work as well in practice as it did in theory, and did not win over gamers like it was thought it would. 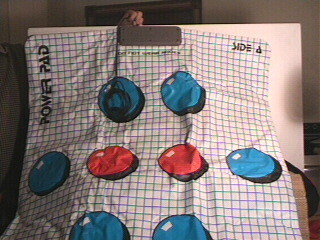 This device, first introduced by Bandai and called the "Family Fun and Fitness", and then taken over by Nintendo and renamed the "Power Pad" (at least it was in the US, I don't know about Europe or Japan), was a mat with 10 different "buttons", two in the middle and a set of two in the front of, in the back, and to the left and right of the player, and two red main "buttons" in the middle, which the player usually started off standing on. The device plugs into controller port 2 on the NES. Not many games where made for this accessory (see games list below) and was only supported by Bandai and Nintendo. The games that are available are all lame, and not really worth a serious gamer's attention, and only worth buying if you are an NES collector (which I am). Most of these games are fairly common, and cheap, since they have such limited appeal.